An electric multiple unit or EMU is a multiple unit train consisting of self-propelled carriages, using electricity as the motive power. An EMU requires no separate locomotive, as electric traction motors are incorporated within one or a number of the carriages. Most EMUs are used for passenger trains, but some have been built or converted for specialised non-passenger roles, such as carrying mail or luggage, or in departmental use, for example as de-icing trains. An EMU is usually formed of two or more semi-permanently coupled carriages, but electrically powered single-unit railcars are also generally classed as EMUs. EMUs are popular on commuter and suburban rail networks around the world due to their fast acceleration and pollution-free operation. Being quieter than DMUs and locomotive-drawn trains, EMUs can operate later at night and more frequently without disturbing residents living near the railway lines. In addition, tunnel design for EMU trains is simpler as provisions do not need to be made for diesel exhaust fumes, although retrofitting existing tunnels to accommodate the extra equipment needed to transmit the power to the train can be expensive and difficult if the tunnel has limited clearance. The first EMUs were used on the elevated Liverpool Overhead Railway in 1893. The southern terminal of the railway was underground, giving the LOR the distinction of also being the first to use EMUs underground. Each carriage had an electric traction motor and was specifically designed and constructed to be light in weight while running on elevated steel sections. The first EMUs were two-carriage trains later graduating to three carriages, with the front and rear carriages powered. 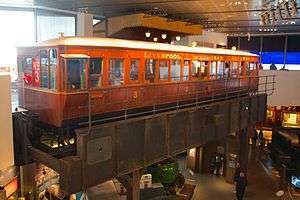 Liverpool Museum retains an example of the Liverpool Overhead Railway EMU carriage. An early proponent of EMUs was the American engineer Frank J. Sprague, who supplied them to the South Side Elevated Railroad in Chicago in 1897. Many modern 2-car EMU sets are set up as "married pair" units. While both units in a married pair are typically driving motors, the ancillary equipment (air compressor and tanks, batteries and charging equipment, traction power and control equipment, etc.) are shared between the two cars in the set. Since neither car can operate without its "partner", such sets are permanently coupled and can only be split at maintenance facilities. Advantages of married pair units include weight and cost savings over single-unit cars (due to halving the ancillary equipment required per set) while allowing all cars to be powered, unlike a motor-trailer combination. 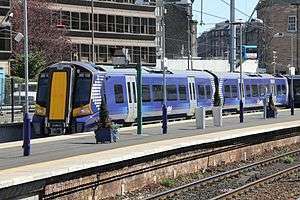 Disadvantages include a loss of operational flexibility, as trains must be multiples of two cars, and a failure on a single car could force removing both it and its partner from service. Some of the more famous electric multiple units in the world are high-speed trains: the Shinkansen in Japan and ICE 3 in Germany. The retired New York–Washington Metroliner service, first operated by the Pennsylvania Railroad and later by Amtrak, also featured high-speed electric multiple-unit cars, see Budd Metroliner. ↑ N. K. De (2004). Electric Drives. PHI Learning Pvt. Ltd. 8.4 "Electric traction", p.84.